Our goal is to have 20 Cultural Sanctuaries in place by 2028. Our first Sanctuary is in Bhutan. Its protection was ratified in law by the Bhutanese Government early 2018. Our second Sanctuary is in Mexico and involves the wholesale protection and promotion of Mayan culture across the Yucatan Peninsula. The project is well underway – with a documentary film in production and a Living Museum in design. We are currently working on Sanctuaries in each of Mongolia, Ecuador and Colombia, with early stage discussions underway also in Patagonia, Kenya and French Polynesia. Each country presents complex and nuanced challenges but a huge opportunity. Our projects in Bhutan, Mexico and Mongolia make for three interesting examples. In Bhutan, the government and royal family are ahead of the rest of the world in taking a long-term and holistic view in all decision-making relating to its land and people. Seventy per cent of the country is under forest cover and it is the only carbon negative country in the world. Bhutan can and should be a role model for the rest of the world but it is under threat, mainly due to the economic pressures on a small country and to the changes that the twenty-first century and technology inevitably bring. We want to shine a spotlight on the Bhutanese approach and show how it is possible to maintain forest and culture while embracing modernity and promoting green and renewable energy. The oldest indigenous community in Bhutan are the Olep people of Rukha. The Olep are vibrant, hard-working, committed to the preservation of their culture and proud of their heritage. The valley in which they live is stunningly beautiful and the community is currently almost entirely self-sufficient, living off the forest and the land. But the Olep are under threat. A very controversial road comes ever closer to the village, the youth of the community are increasingly but reluctantly lured by the lack of economic opportunity in their cherished valley to move to the country's capital and the endangered Olep language itself is dying. At our Sanctuary in Rukha, working closely with the Bhutanese Government and The Tarayana Foundation, we have secured the protection of the traditional Olep culture and language in Bhutanese law. With a team of Bhutanese and ‘international’ anthropologists, linguists, botanists, ethnobotanists and documentary photographers and filmmakers, we have created the first comprehensive survey of the Olep culture and we have created the first written record of the Olep's language. We are introducing appropriate ecotourism as a new source of economic opportunity for the local villagers and farmers who want to stay with their land but who are increasingly lured away by economic duress to menial urban jobs. Finally, we have built a cultural centre for the Olep community, which will serve as a gathering place for the village, a centre for community workshops and discussion, a "living museum" of the Olep culture, an archive of the survey and language dictionary and a guesthouse for tourists. The centre is in traditional Bhutanese style and has been built by the carpenters of the Olep community themselves. The Bhutanese government are now eager to replicate the Rukha Cultural Sanctuary that we have created in other areas of Bhutan. In the Yucatan, we are partnering with The Baktun Foundation and Transformacion Arte Y Educacion A.C, to ensure the protection and promotion of the Mayan culture and traditional language. The Mayan culture is of course much better known and recognized than those of our Sanctuary in Bhutan and in our other project areas and it is very much alive and, in some ways, thriving. The Mayan people are proud and strong. The culture is, however, in urgent need of protection. Climate change and economic realities are such that, increasingly, many Mayans leave their land to work in menial and other jobs in Cancun and surrounding cities and the forces of expanding commerce, a growing population, industrialization and modernization are having a profound impact particularly on the young Mayans within their traditional communities. With the moves away from the land, the culture is stretched and loses relevance. The written Mayan language is increasingly not known by the young. With Baktun and TAE, we are working to protect and promote the Mayan culture and language and like in Bhutan, that protection and promotion have a number of key elements. We are creating film documentation of the culture – working with the Mayan community to identify and showcase the depth, beauty and complexity of the Mayan culture and language. We are creating a Living Museum in the centre of Izamal - as a gathering place for the community, a focus for workshops, lectures and arts and crafts and a living, breathing destination for tourists eager to learn about Mayan culture. The final piece of the puzzle will be the legal protection of the Mayan culture in Mexican law, the Government’s promotion of cultural tourism in the Yucatan and the introduction of compulsory Mayan language teaching in schools. This exciting, large and ambitious project is well advanced and we will soon be able to provide further updates on its progress. 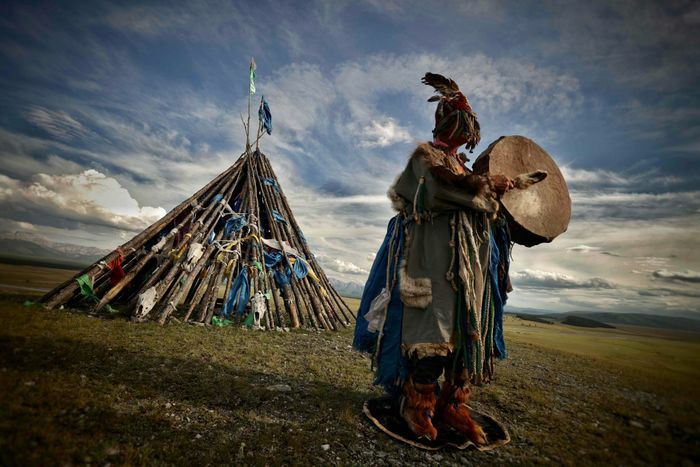 Our project in Mongolia focuses on two crucial, albeit very different, communities: the eagle hunters located in the far West of the country and the Tsaatan people, the deer herders, located in the Ulaan Taiga National Park in the far North West. In meeting and talking to the elders of both communities, it is clear not only how important it is to protect and celebrate these communities and their culture but how in different ways these communities and their ways of life are under threat. Both of these communities are made up of proud, hardy and family-focussed people that live off the land as they have done for centuries. They are in some ways distanced from the modern world by their physical remoteness and the conditions for much of the year are incredibly harsh with long, extremely cold winters. However, now, alongside the growing impact of climate change on the herders and the lifestyle of the communities, increasing tourism brings more and more challenges. International and national agencies attract visitors fascinated by the beauty of the vast Mongolian landscape and the richness of its culture but, all too often, the communities themselves receive only the downside of tourism and none of its benefits. Visitors often stay on their land, bringing their own horses, porters, tents and food and encroaching on the communities' day to day lives but provide no economic benefit. We are working to change that, to encourage eco- and cultural-tourism that brings opportunity and economic advantage to the communities and to protect the hunters' and herders' land, way of life, language and culture. We will build nomadic community centres in the form of tepees or gers that will move with the communities as they move between their seasonal camps and will double up to provide homestay opportunities for the communities’ economic benefit. We will bring workshops and support to help the communities to benefit from tourism and we will work with the Mongolian government to protect and promote these vital and vibrant cultures.